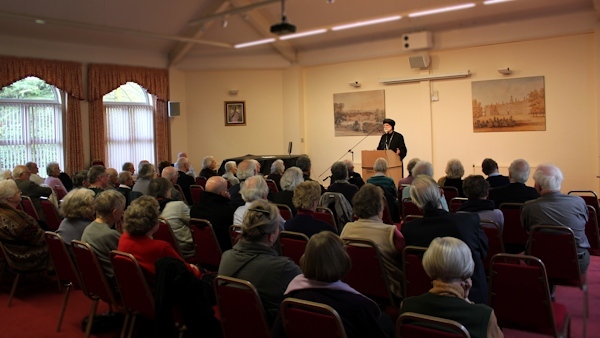 As one of their Lenten speakers, the chaplaincy of Morden College, Blackheath, invited Abba Seraphim to reflect on the current situation 0f Christians in the Middle East. 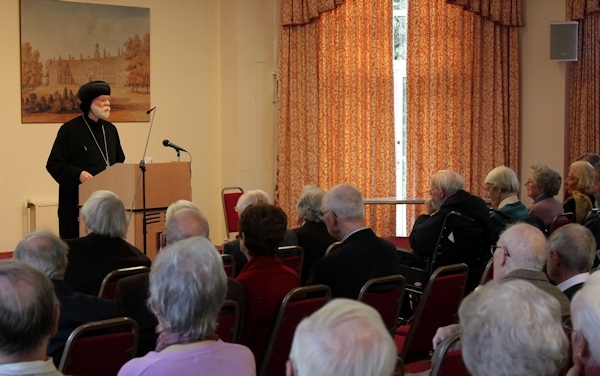 Addressing a large audience on 8 March, Abba Seraphim outlined the problems of Christians in Iraq, Syria and Egypt since the Millennium and took the decline in the historic Christian communities in Iraq as a warning to the Christian world of how fragile they have now become. The problems faced by each country were each quite distinctive and owed much to their respective histories since the break up of the Ottoman Empire and the rise of militant fundamentalists. He emphasised the significance of Egypt, with the largest Christian community in the Middle East and the dynamic life of the Coptic Orthodox Church in the face of continuing sectarian attacks. Following a number of thoughtful questions from the audience, the Rev’d Nick Woodcock, chaplain, invited Abba Seraphim to lead the audience in prayer for the Christians of the Middle East.